Just when you thought it was safe to buy some actual food, Aldi go and put a bunch of great gadgets up for sale at crazily low prices. Oh well, you can eat next month, as you'll definitely want to empty your bank account on this new range designed to kit out your kitchen with everything you could hope for. We review the Aldi Kitchen Specialbuy Range. The thing that really caught our eye about this particular range was not just the low prices, but also the number of genuinely useful kitchen gadgets that every home needs. The line, which went on sale from 22nd October, includes an Espresso Maker (£59.99), a Coffee or Spice Grinder (£12.99), a Soup Maker (£49.99), a Halogen Oven (£29.99), a Deep Fat Fryer (£24.99), a lovely looking Salter Sweetie Scales (£29.99), a Milk Frother (£19.99), and a Large Slow Cooker (£16.99). We were a bit embarrassed to not already own one of these, but are bloody glad Aldi threw one in. 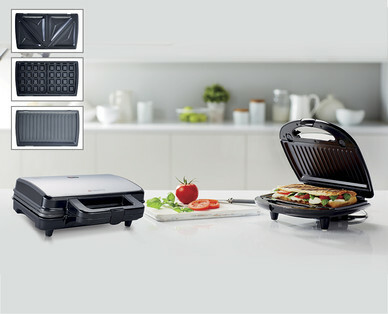 A steal at less than fifteen quid, the Sandwich Toaster is actually a three-in-one, possessing swappable heating plates to cook paninis and waffles, as well as the standard toasted sandwiches. This one we really couldn't believe: a big slow cooker for only £16.99... and it isn't a huge pile of crap! 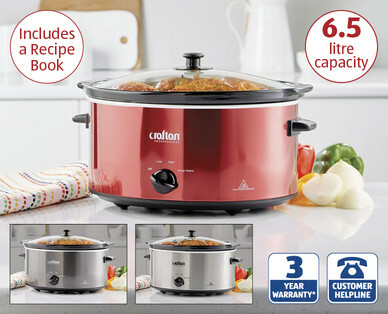 The decent capacity is plenty big enough to slow cook a whole bird (ooo, pardon! ), while the settings knob (ooo, pardon!) features three levels of cooking intensity. 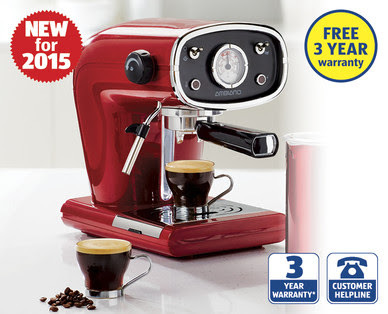 The perfect way to accompany an espresso maker? Why, yes... a milk heating and frothing gadget. 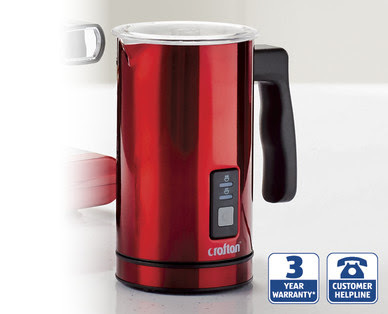 This one is great in that it can either heat your milk or just froth it (or both, obviously), while possessing a handle which lets you easily pick it up and pour. Although the Kitchen range includes a few different styles of drinking receptacles, we received the two pack of liqueur coffee glasses. 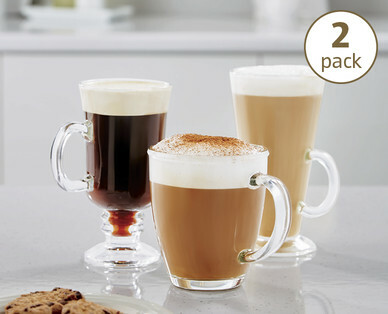 Solidly made and with handles, these are perfect for Baileys lattes or Baileys hot chocolate or, if you can't be bothered to make the coffee, just Baileys.